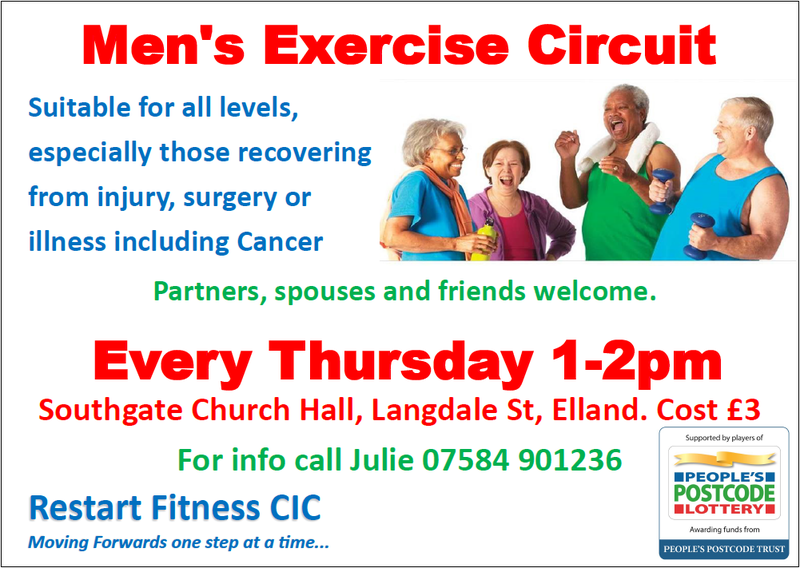 The Men’s Exercise Circuit costs just £3 and is suitable for all levels, especially those recovering from injury, surgery or illness including Cancer. At Southgate Church Hall, Langdale St, Elland. Partners, spouses and friends welcome. This entry was posted in Elland, Get Involved / Have Your Say and tagged Elland, Exercise, Get Involved, Health, Southgate Methodist Church, Thursdays. Heartbeat is a registered charity based in Brighouse and run by volunteers who provide Exercise and Tai Chi classes, social events and walks for people who have had or are at risk of having a cardiac event. Walks are organised every alternate Tuesday morning and every Saturday. Walks typically last 2 to 3 hours and usually end with a lunch. Organised through trained walk leaders the walks are FREE to all members, carers and parents. People who do not meet the set criteria are welcome to join the walks as an Associate Member providing they pay the annual membership fee of £5. See your Doctor or Practice Nurse and ask to be enrolled in the Better Living Programme. This entry was posted in Brighouse, Get Involved / Have Your Say and tagged Brighouse Heart Support Group, calderdale, Exercise, Health, Health Walks, Heartbeat, Tai Chi, walking. 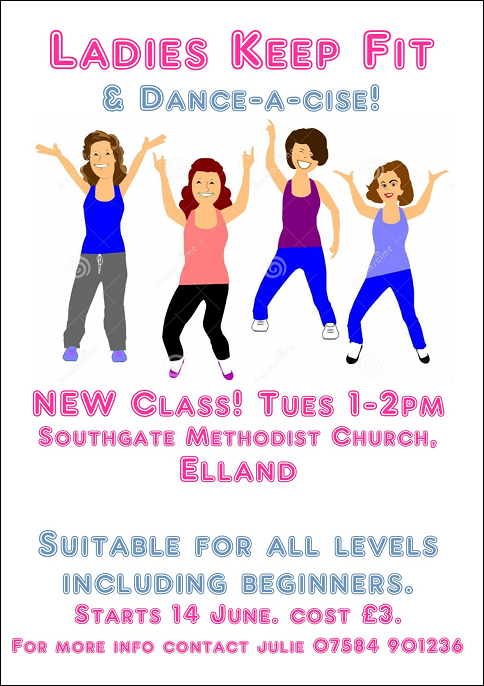 New fitness & dance class suitable for all levels including beginners and just £3 per session. At Southgate Methodist Church, 1 Savile Road, Elland, HX5 0LA. This entry was posted in Elland, Get Involved / Have Your Say, June and tagged Dance, Elland, Exercise, Fitness, Get Involved, June, Keep fit, Ladies Activity, Southgate Methodist Church. Get active with Tai Chi at Elland Golf Club – Relax in the peaceful club house lounge overlooking the course and its vista of trees and well-kept fairways and stay in the clubhouse for some lunch or a coffee after. Costs just £3 per session and everyone is welcome to get involved. This entry was posted in Elland, Get Involved / Have Your Say and tagged CREW Heart Support, Elland, Elland Golf Club, Exercise, Get Active, Get Involved, Health, March, Tai Chi, Wednesdays. The latest edition of Wildside – the walks and events programme produced by Calderdale Council is now available in local tourist information centres, libraries and sports centres. This year’s programme is packed full of walks, events and practical days suitable for adults and families so why not pick one up today or visit www.calderdale.gov.uk and search for ‘walks’ or have a look at the events calendar to find out more? This entry was posted in Get Involved / Have Your Say and tagged calderdale, Calderdale Council, Events, Exercise, Family Activities, Get Active, Get Involved, Go Walking, Health, walking, Wildside. 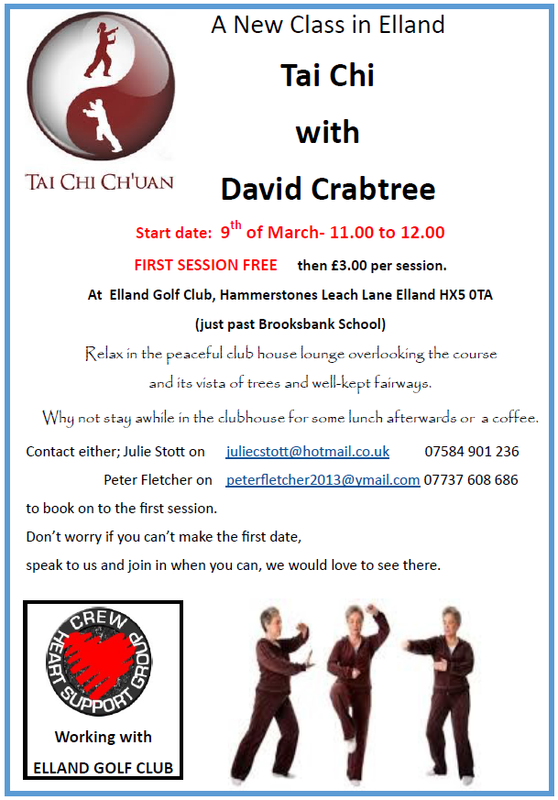 Get involved and get active with a new Tai Chi class at Elland Golf Club – Relax in the peaceful club house lounge overlooking the course and its vista of trees and well-kept fairways and stay in the clubhouse for some lunch or a coffee after. This entry was posted in Elland, Get Involved / Have Your Say, Mar and tagged Elland, Elland Golf Club, Exercise, Get Involved, Health, March, Tai Chi. This gentle exercise can be performed either standing or sitting and the exercises are designed to reduce the risk of falling by developing and improving balance, strength, flexibility, body awareness, posture & co-ordination. Todmorden Fielden Centre – Call 01706 817926 for more information. If you would like to use this service or to talk to an Age UK staff member about what can be donefor you, please contact Age UK Calderdale and Kirklees on 01422 252040, email enquiries@acck.org.uk or visit www.ageuk.org.uk\calderdaleandkirklees. This entry was posted in Get Involved / Have Your Say, Greetland & Stainland and tagged Age Uk, calderdale, Exercise, Get Involved, Health, Tai Chi. 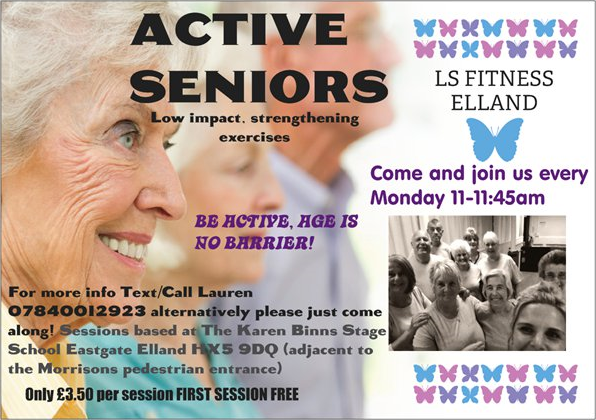 Get involved with LS Fitness Elland and take part in low impact strengthening exercises for active seniors at just £3.50 per session with the first session FREE. For further information text or call Lauren on 07840 012923 or just go along to one of the sessions. This entry was posted in Elland, Get Involved / Have Your Say and tagged Elland, Exercise, Get Involved, Karen Binns Stage School, LS Fitness, Staying Well.